Christmas is one of our team’s favourite time of year, and this year we are ramping up our celebrations by participating in the Whitehorse Carols. 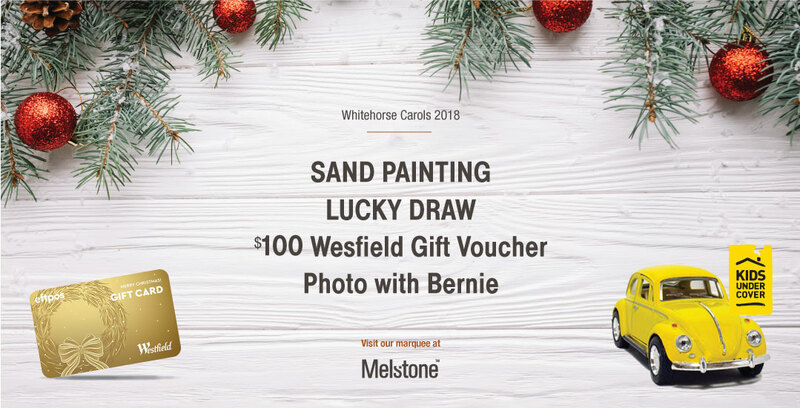 We’ll be spreading the Christmas cheer by hosting a marquee at this year’s carols where kids can get creative with sand painting and enter our lucky draw to win one of two $100 Westfield gift vouchers. For the carols we have partnered with amazing local charity Kids Under Cover who are dedicated to preventing young people becoming homeless within Australia. They build small studios in the backyards of homes to keep young people connected to family. They also offer scholarships to ensure ongoing education or job training. The Kids Under Cover team will be there with their Donate Your Car® mascot Bernie (the big yellow car!) to help raise funds for their organisations. Aside from all the fun at the Melstone marquee, there will be performances at the carols from popular performers Rob Mills and Verity Hunt- Ballard, children’s acts The Mik Maks along with performances from the local talents of the Blackburn High School Senior Jazz Orchestra, the Australian Girls’ Choir and the Combined Churches of North Blackburn. Let’s not forget the star of the show….Santa! He will be there with his elves to say hi to all the children. Make sure you put this event in your calendar and come down with your friends and family and say hi and join in the carols! For full event details visit: www.facebook.com/WhitehorseFestivalSeason.